While we’ve updated our Facebook page, we thought it was about time to dive in and attempt post an update on our new website. So here goes. 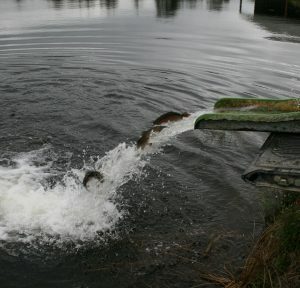 Some you will know that we restocked last week, so while that was good, unfortunately with the previous hot weather the farmed trout were not feeding, so the weight of the delivery was not quite what I hoped for. That’s not the farm’s fault, but a fact of life and we should be grateful that we still have a good flow of water, the loch has not dropped and we are open, unlike some fisheries south of us. We would have hoped that the introduction of new stock would have chivvied up the residents, but the result was not quite what I was expecting. While we did see an increase in fish being caught, we saw a fall in the number of rising fish. The only reason I can think is that since the restocking the weather has been “changeable”. A few days of warm, sunny weather only to be followed with the barometer falling accompanied with rain and, on occasions, thunder and then a short period of high pressure, etc. Besides the up and down weather conditions, we also experienced changing wind direction. All in all, not the ideal conditions that trout prefer. While this might sound a little gloomy, the dry fly anglers have still enjoyed success, as you would expect at this time of year. It would seem that the pattern does not particular matter, so long as the fly is dark in colour. By way of an example, Black and a Claret Hopper and a Beetle. Sub-surface Buzzers have not fared as well as we would have expected, some anglers have tempted fish. However, Suspended Buzzer have worked when the fish are feeding and rising. Once again, it seems that the darker patterns have been more productive; no pink buzzers have been recently used to my knowledge! Traditional wets and nymph patterns have also attracted the attention of the trout. By these I mean Black Pennell, Black Gnat, Hare’s Ear, including a Gold Head Hare’s Ear. A couple of anglers used lures and while 1 angler reported using a WSW, other just wrote Lure or Black Lure. Damsels have not been reported, but a number of anglers have not recorded what fly was successful, so all of the above is based on speaking to the anglers during their visits. The size of fish caught has varied from a 1 3/4lbs rainbow (recent stockie) to a circa 4 lbs brownie, caught on the 2nd cast! However, we’re pleased that with the number of fish caught and returned weighing 3 and 4 lbs were also reported and we had a number of anglers saying they had been broken by some fierce takes. I wonder…………… The best bags didn’t quite manage double figures, but we’ve had a 9, 8 and a number of 6 fish bags. Considering the conditions we’re quietly content, and so were the anglers.